I met a homeless woman the other day. Walking out of Waterfront Station on my way to a workshop downtown, I saw her sitting on the sidewalk reading a book, her back against a bank of mailboxes and a blanket over her lap. This is not an unusual site in Vancouver, where over 2,600 people live on the streets. I stopped to talk to her. She told me that the shelters were full, that she was trying to raise enough money to get a hostel room. I’ve heard this story before—there are not nearly enough shelter spaces here. As she talked, I looked at the sores on her face, her stringy hair, her bad teeth, trying to judge how old she was. It was impossible; she had an old-before-her-time face that spoke of a hard life. She might have been in her early 20s or she might have been in her late 30s. She told me that she was cold and hungry, that I was the first person to stop for her in two days. And then she broke my heart. “I’m pregnant,” she said, moving the blanket and showing me the outline of her belly. We talked about the book she was reading—it was one her mom had loved—and about other authors she liked. She told me that she was seven months pregnant, and she smiled and ran her hand over her belly just like any mom-to-be in the suburbs would do. I have no idea what she’s been through in her life. Her current circumstances are vastly different from mine. But, like me, she’s somebody’s daughter. And she’s going to be somebody’s mother. By the time I came back to Waterfront Station on my way home eight hours later, it had started to rain and the woman was gone. In the two days since then, the rain has not stopped. The stormy November winds have kicked up. This is not a pleasant time of year in Vancouver. The dampness seeps right through to your bones and the cold wind hurts. I’ve been stopping during the day and waking up in the middle of the night, wondering where she is. Where will she go once her baby’s been born? How will they cope? Last month, I spent most of Thanksgiving week volunteering downtown with Gratitude Week to End Homelessness, an organization raising money to restore two residency hotels on the Downtown Eastside. I had the good fortune to be assigned to the Gratitude Wall, where we invited passersby to make signs celebrating something they were grateful for. And they did, even in the wind and pouring rain—over 600 of them. I talked to more people in those few days than I usually do in a month: business people, homeless people, whole field trips of school kids, tourists who were shocked to see people sleeping on the sidewalks in such a beautiful city. I talked to a guy with a huge smile that showed the single tooth clinging to his bottom gum. A woman on welfare dug her last 26 cents out of her pocket to put into the collection bucket, proud to have something to give. A man who has struggled with mental illness was grateful that his wife had proposed to him. One homeless guy gave us a dollar. He said that it was an investment in his own future. If he gave a dollar now, it might mean that he would have a place to stay someday. He told me he had been lost for a few years but that he now had a home and a good life. An old guy with a smile that lit up his wizened face stopped at my table to see what it was about. He lives in a residency hotel and spends his days walking downtown. He was full of stories of the hotel and the streets—stories, he said, that no one was interested in hearing. Well, I was, so he came back on another day and hung out with me again. He had come to the Gratitude Week site to sit in the heated tent where speakers gave lunchtime talks about mental health issues. He wasn’t there to listen so much as to sit. He wondered why nobody set up tents like that for the homeless on cold winter days. A chair, a roof, a heater: “That must be what heaven is like,” he said. On my way home from the site one day, I went into the mall. As my fingers and nose started to thaw out, I was aware of the fact that because I have clean clothes, a place to shower every day, and some money in my pocket, I was welcome to come inside to warm up and use the washroom. Later, when I stopped in at our neighbourhood grocery store, I saw a sign on the community bulletin board advertising a Botox party—get rid of your wrinkles with your friends in the comfort of your own home! I wondered how two such different worlds could exist at the same time, so close together. So here I sit in my chair, with a solid roof over my head and a furnace pumping heat through the vents, wondering and worrying about that pregnant woman and the thousands of other people who might be out in the rain today, unwelcome in the warm places. In the world I live in every day, we complain about what we don’t have, about our wrinkles or our slightly out-of-date electronics or our couches that are not quite the right colour. But to many people in that other world, this just might be what heaven is like. I know that I haven't posted in ages. As many people with school-age kids know, June can be as busy as December, except without the holiday shopping. As the school year and the kids' activities draw to an end, our lives are filled with school assemblies, parties, thank-you teas, rehearsals, and performances. Last weekend alone I spent 10 hours either watching performances or working backstage. All of this is juggled within our regular schedule of work and school. On Mother's Day I posted something that I'd posted elsewhere before. Will I dare do the same today, on Father's Day? You betcha--but not out of laziness. The following column was published nine years ago in a parenting newsletter. I wrote it as my first fatherless Father's Day approached, and every June since then, I've dug it out and read it again. It reminds me of just how much my dad is part of my everyday life even though he's not here with us anymore. This is going to be a hard Father’s Day for me, because my dad died a few months ago. I grieve not only because I’ve lost my father and friend, but also because my children have lost their grandfather. My son, who is four, will probably have hazy memories of his Grandpa John, but my two-year-old daughter won’t remember him at all. I’m so sorry that they won’t have the chance to really get to know him. My dad had an ordinary kind of life. He wasn’t famous or rich, nor did he have a prestigious job or a bunch of letters after his name. Although he worked hard, he wasn’t particularly amibtious. I don’t think he analyzed his parenting style or his kids much, the way many of us do today. He just lived his life in the way he thought best, and in doing so, he taught me some valuable lessons. When I was little, my parents opened our small house to people needing a place to stay; we also worked in a soup kitchen. We were exposed to diverse ways of life, and I learned not to be quick to judge others. I don’t know what they’ve had to face in their lives, nor where I’d be under the same circumstances. My dad was always one to lend a hand, showing that small actions can make a big difference to someone else. I don’t remember many big gifts that he gave me. I do, however, remember very clearly my joy when he brought home things like brand new writing tablets, blank and full of potential, or cigar boxes for my crayons and treasures (I still have one). These small, everyday gifts were the really important ones. Our favorite times together weren’t exotic family vacations, but trips to the library and hours playing cards. Activities don’t have to be exciting or even productive to be worthwhile. My dad was one for field trips. When we got in the car with him, we never knew where we’d end up—maybe it would be a greasy-spoon restaurant with fabulous food or a bizarre museum. These trips taught me the benefits of flexibility, curiosity and individuality. Sometimes you get great rewards by throwing away your plans and turning onto an unknown road just to see what you’ll find. If you always follow everyone else, you’ll miss out. While my children are young, some parts of my life are on hold, but I know that I don’t have to abandon my dreams. As a kid, my dad wanted to join the merchant marine, but he ended up as a salesman, a sensible job for a family man. After retiring, he discovered a merchant marine WWII Liberty ship maintained and run by volunteers in San Francisco. He joined the crew and lived his childhood dream. He undertook difficult training to get his certification as an able-bodied seaman, which showed me that learning is a lifelong process. One of his greatest experiences was being at the ship’s wheel through the Panama Canal; he was 63 years old. My dad and I had our problems and disagreements, as all families do, but I always knew that he loved me. I now realize the importance of his unconditional love. Reflecting back on his life, I see that this man, who led an ordinary life, working an ordinary job and living in an ordinary house, was an extraordinary person, wiser than he ever knew. I tell my kids that, although we can’t see Grandpa John anymore, he’s still in our minds and our hearts. And he’s very much alive in the person I am now. My kids may never have the fun of hanging out and learning to play dominoes with their grandpa, but at least I can pass his spirit on to them. Taken May 10, 2009, at home. I guess I just can't get enough of those flower pictures, because while taking a break from weeding yesterday, I took some more. 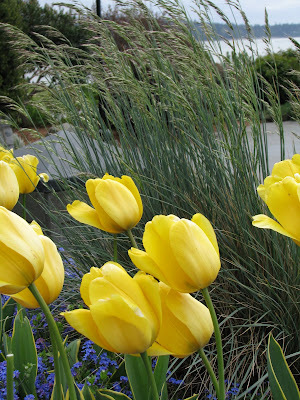 And this one fits Carmi's current Thematic Photographic theme, yellow. Also taken May 10, 2009, at home, while trying not to step on the neighbouring pansies. I once had a neighbour who kept an always-up-to-date, drawn-to-scale map of her garden. She knew every plant by name, colour, and blooming season. Her garden was beautiful--the map itself was beautiful. While I aspire to having a garden as gorgeous as hers, I don't think I will ever be as organized about it as she was. That's fine with me, because I love rediscovering forgotten friends like these guys. Two years ago, back when I had a little MySpace blog, I wrote the following piece. I thought I would post it here today, after a very nice Mother’s Day in which I was served breakfast, lunch, and all the tea I could drink. You might notice that nested within this recycled writing is another bit of recycled writing. Am I thrifty or lazy? You decide. I’ve been surprised at how much I’ve changed since those overwhelming first weeks with a premature baby and a move to our first house (note to anyone thinking of having children: Don’t plan on moving three weeks after the baby is born. You are not in control of the timing, and you may end up moving when that baby is 10 days old instead). I’ve coped with things I never thought I’d be able to cope with: being thrown up on, going five years without regular sleep, and unexpectedly giving birth to my second child in my own living room. I’ve forced myself to do things I didn’t want to do, like learning to drive—the thought of boarding a bus with a crying baby, a stroller, and three bags of groceries was scarier than finally getting behind the wheel. I’ve also gained a new perspective on the big picture of my life. I was seven months’ pregnant with Child Two at my doctoral defense; her kicks were a constant reminder that my work is not the most important thing in my life anymore. While I sat in the stylist’s chair yesterday, I thought about those words and the things I’ve learned in the six years since I wrote them. I’ve learned just what I’m capable of—pursuing a second master’s degree while being a work-at-home mom with two young kids, my own business, and some serious volunteer commitments. I’ve also learned that I don’t want to be quite that busy. I’ve learned to be an advocate for myself and my children, whether that has meant standing up to a doctor whose personal life was overriding my need for proper care during a potentially life-threatening situation, or talking to the principal when my son is being bullied. I’ve learned how to put Child Two’s hair up in a bun, which was about as hard as learning to drive. I’ve learned that there’s a difference between have to and get to and that my entire perspective changes depending on which phrase I use. When Child Two was younger and too scared to be the only one awake in the house at night, I had to get up whenever she needed to go to the bathroom. But, shivering on the side of the bathtub, I got to here my sleepy girl say “I love you sooooooo much!” I have to drive my kids here, there and everywhere, but I get to have wonderful conversations with them about their lives and the world on the way. I have to pay for and wait through countless hours of music lessons and ballet classes, but I get to watch their priceless performances. From September to March I have to spend just about every Saturday under an umbrella at the side of a soccer field, but I get to see their joy when they make a great save or score a goal. I have had to change my life in so many ways. I don’t stay up late partying. If I’m up in the middle of the night, it’s because I’m trying to meet a deadline or someone’s sick. My day is full of details—it’s Child One’s library day or we need milk or Child Two’s ballet clothes need to be washed before Friday—and sometime I wonder if my tired brain is even capable of something like analyzing the sound systems of languages anymore. But I get to watch two amazing kids grow up—funny, talented (in my biased eyes), caring, and so interested in the world around them. “Are you a mom?” Yes, I am, and I’m blessed to be. With all these two have given me, who should be thanking whom today? I haven’t participated in Carmi’s Thematic Photographic since back in September, when I was still posting in two blogs (my last two Thematic Photographic pictures, from the theme faded, are here and here). It's not that I haven’t wanted to. The thing I love about his project is that looking through my photos for ones that fit a specific theme makes me see them from a different perspective. But it also takes time, especially given the fact that, while I’m really good about uploading my photos to my computer regularly, I’m not so good at weeding out the bad ones and labelling the rest. I won’t even mention the cupboard full—absolutely full, as in I can’t fit even one more in there—of unsorted and unlabelled pre-digital-era prints in our storage room. It’s too scary to think about. Anyway, here I am again. Carmi’s theme this week is yellow. It seems that the only yellow things I take pictures of—aside from the odd shot in which one of my kids happens to be wearing a yellow shirt—are flowers. Good Glorietta (as my mother would say), how many pictures of flowers have I taken? A gazillion, at least. I’m like a flower paparazza. With my propensity to shove a camera in their petally little faces, it’s a good thing I live in a place with so many gardens. 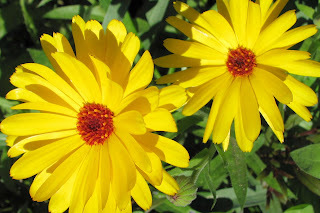 Here is a sampling of my yellow flower pictures. I’m putting them all in one post because, given my track record, I won’t manage to get them all posted if I do them one at a time. 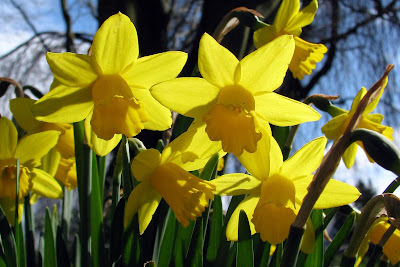 Daffodils under a tree. Taken March 24, 2008, in Vanier Park, Vancouver, BC. 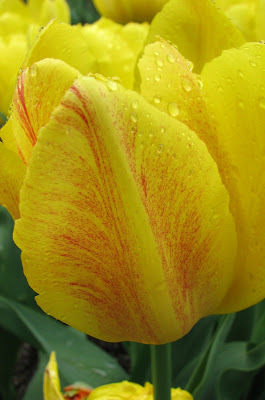 Tulip in the rain. Taken April 27, 2008, in Stanley Park, Vancouver, BC. Tulips in the wind. Taken May 7, 2008, at Dundarave Beach, West Vancouver, BC. 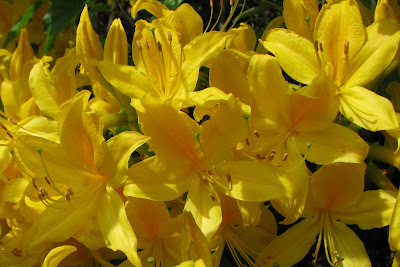 Azalea explosion. Taken May 25, 2008, somewhere in Ambleside, West Vancouver, BC. 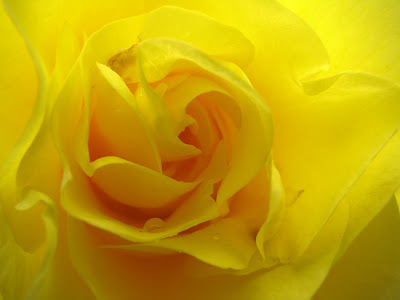 Yellow rose. Taken June 18, 2008, in my mom’s garden. Calendula (I think). Taken August 4, 2008, in one of the community gardens at Ambleside (I think), West Vancouver, BC. As if these aren’t enough, I’ve posted at least two other yellow flower pictures in the past: sunflowers and a zinnia. On this rainy morning I appreciate an infusion of yellow. Thanks, Carmi. The last month has been a strange one for our family, full of ups and downs. Fortunately—so far anyway—the downs have not been as bad as they might have been, and they’ve all been followed by ups. 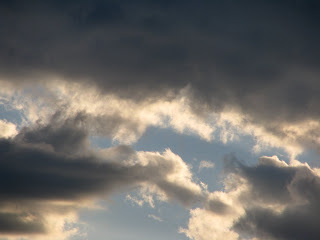 As I told a friend, I feel like we’ve been walking under a black cloud and then finding a patch of sun, only to walk under the cloud again and then find another patch of sun. Black cloud: We were in a car accident. Sun: No one was seriously hurt. Black cloud: It looked like my car might be written off. Sun: The estimate for the repairs squeaked in under the insurance company’s limit. I was without my car for a couple of weeks, but I have it back now and it looks better than before the accident. Black cloud: A family member was seriously ill. Sun: She’s okay now. Black cloud: It looked like her cat (her main companion, as she’s housebound) might have to be put down. Sun: It was a false alarm. Black cloud: Child One damaged someone’s new car with his car door. Sun: It’s been three weeks and the guy hasn’t contacted us to pay for the repairs, so we’re hoping that it turned out to be an easy thing to fix. Black cloud: My husband’s company announced that there were major layoffs coming. Sun: We found out yesterday that he’ll be keeping his job. And living with this hanging over us for almost a month has been a good exercise for our family—one we’d rather not go through, of course, but good nonetheless. We already live a fairly simple life compared to a lot of people. Our kids are not into the latest this and that. My husband and I are very experienced at living frugally, having made it through a ridiculous number of years at university without student loans (in fact, we managed to save up enough money for the down payment on our first house during that time). Over the last few weeks, as we thought about what losing our major source of income would mean, we realized just how much of an advantage our lifestyle and experience would be. And we realized how much we would still have—so much more than most people in the world. Life is still a bit cloudy, but I’m grateful for every patch of sunshine. Despite the economy, my desk is still full of all the work I can handle. A client recently paid me more than I invoiced because she was so grateful for the work I did. My family is happy and healthy; we have a roof over our heads and enough to eat. And, thank goodness, I can finally put the snow clothes away. As I said to my friend when things were looking bleak, there’s nothing to done but to keep walking and carry an umbrella.